Setup: Line up 2 even teams of opposite sides of the table. Each person needs their own cup with some beer in it. Gameplay: One person on each team starts the game by tapping each other's cups then drinking their beer. Each person must drink their beer, place it on the edge of the table, and flick it from the bottom to get it to land upside-down. If they don't get it, they must keep trying until they succeed. The next person can start drinking after the first person is successful. 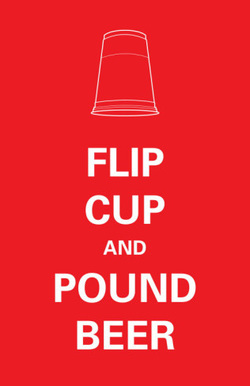 End of Game: The game is over when one team has successfully flipped all of their cups.